Appearing on Match of the Day, the longest-running television football show in the world, is the stuff of dreams. And Clarets centre back James Tarkowski admits it was "surreal" to be singled out for praise on the legendary programme, which has been running since August 1964. The Mancunian's display in the 1-0 win at Everton earlier this month was admired, as Burnley collected a third clean sheet in four games. 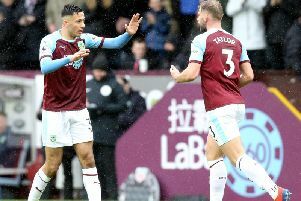 Tarkowski hopes he can continue to catch the eye, but isn't letting the attention go to his head: "When I sit there watching, it is a bit surreal sometimes. “But I’ve always tried to have the mindset of never too high with the highs and never too low wit the lows. “There’s always a lot of talk when someone puts in a good performance on television, but I don’t want to get carried away with stuff like that because it’s a long season. “We’re only seven games in so far, so there’s a lot more to prove and to show. “Just because I’m on telly a couple of times, I don’t want to get carried away with that and then if a bad performance comes, not to get too beaten up about it because there’s always another game to come." Tarkowski has started every game this season, after getting the nod for the final four games last term. And, in his first extended spell in the Premier League, he has stacked up some impressive statistics alongside Ben Mee. Mee, however, has most headed clearances, with Tarkowski third. The former Oldham and Brentford man is determined to continue making the most of his opportunity at the top level: “I want to spend the rest of my career at this level now. "And I won’t do that just by having seven or eight good games and then taking my foot off the gas. "I’ve got to keep at it on a Saturday or a Sunday and right through the week. “It’s nice when you wait so long and you get your chance, that you do put performances in at the start and you show it was worth the wait. “But it’s a long-term goal and there’s a lot more to come from myself and from the team.